Louis Garrel and Ludivine Sagnier in "Love Songs." 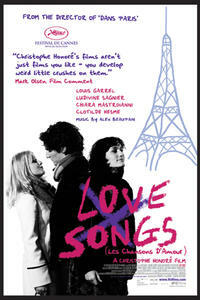 Ludivine Sagnier, Clotilde Hesme and Louis Garrel in "Love Songs." Chiara Mastroianni in "Love Songs." Clotilde Hesme, Ludivine Sagnier and Louis Garrel in "Love Songs." "Love Songs." Poster art for "Love Songs."